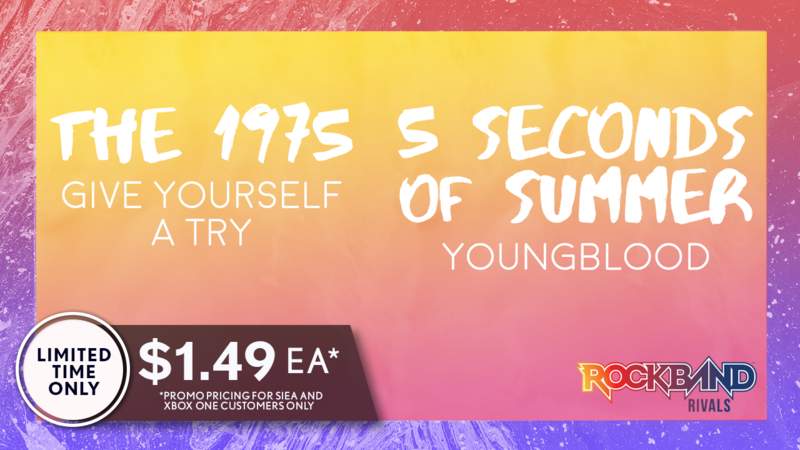 Two songs come to Rock Band, from hit artists The 1975 and 5 Seconds of Summer! Were kicking things off with Give Yourself A Try, the lead single from The 1975s upcoming album A Brief Inquiry into Online Relationships. The 1975 have been playing together since they were teenagers, leading to their self-titled debut album releasing at #1 on the UK Album Charts. Their next album also topped the UK Albums Chart AND the Billboard 200 in the US. If Give Yourself A Try is any indication of how their new album will sound, we cant wait to hear it. Matty Healys vocals are the center of the song, and quick pitch jumps will keep you on your toes. The tempo makes for a stamina-testing drum chart, so be sure to warm up first and then hop into this one! Youngblood is the title track and most recent single from 5 Seconds of Summers newest album. Already spending eight weeks at the very top of the charts in their homeland of Australia, the song has been climbing the American charts all summer as well. This was spurred along by the album debuting at #1 on the Billboard 200, making 5 Seconds of Summer the first band to have their first three albums debut at the top of the chart. The chorus thumps thanks to a 1-2 punch from the bass and drums, so be sure to work together to keep it sounding crisp. Guitarists will play an arpeggiated part throughout, where slip-ups will catch you. The Meet You There Tour starts up next month, so head over to https://www.5sos.com/ to see when 5 Seconds of Summer will stop by your town, and to learn more about the band! For the first two weeks of release, songs can be purchased individually for $1.49 on Sony America and Xbox. Following that two week period, songs can be purchased individually for $1.99. Typo in title; band is The 1975.